Getting towards where you can have a “Wah” experience ! Today after catching up a movie and quick shopping in Kalyani Nagar we thought of having a quick lunch here. Today’s experience was pretty good and thankfully the taste of what is being served here has remain consistent and quality of service was much better and the servers were a lot attentive. 1. Tandoori platter – 3.5/5 – The Paneer Tikka and Achari tikka were good while the Malai Tikka and tandoori chaap were fair enough. 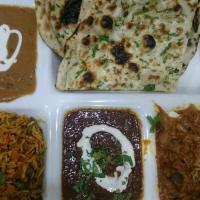 This also includes Daal makhani and a Naan as accompaniments so it adds value to the meal which is good to have. 2. 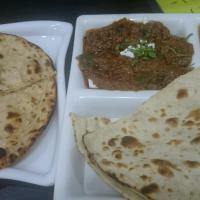 WahJiWah special thali – 4/5, comprised of Veg biryani, Paneer kadhai (a fairly dry/thick gravy version), Daal makhani, choice of one bread to order – we selected lachha parantha, a gravy with chaap and a gulabjamun. Thali was good tastewise, the only downer was the chaap based gravy, didn’t quite like the taste of it. They also have tie-ups with Mobikwik and quickwallet to offer discounts like 20% and 25% respectively which again adds to the VFM factor. This review is based on two outings so far and I can say some of the points I noted are good, some are average and others are nothing to write home about. To start with, it’s definitely a different kind of outlet which has an All North Indian Menu, with loads of combo meals/thali options and is ofcourse a veg only place. They have a variety of starters that are kept in the offing in an attempt to give vegetarians a taste of non vegetarian stuff with these options of vegetarian chaaps that are so readily available in the National Capital Region. Ambience is pretty Ok with around 4-5 tables on the ground floor and further 5-6 tables on the intermediate floor as part of their mezzanine flooring layout where the ceiling could really bump your head if you’re not careful. Coming to the parking side of things it could be a little painful if you have a four wheeler as they don’t have their own dedicated parking so apart from the space for about five cars, one has to rely parking in the bylanes of Kalyani Nagar. Dal Makhani – 4/5, it’s creamy and has got a nice texture and tastewise it’s fairly close to that authentic Dal Makhani of North Indian cuisine yet it’s not the best that I have tasted in Pune. Kadhai Paneer – 3.5/5, slightly different taste of kadhai Paneer than what could usually be found but quite alright. Shahi Paneer – 3/5, it’s a little too sweet for my liking as and like my Shahi Paneer with a subtle hint of sweetness. 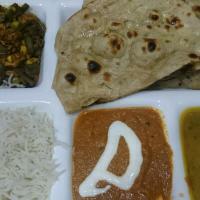 Dal fry – 4/5, this was quite decent and it went really good with steamed rice. Mix Veg – not applicable, it had a hint of foul taste to it which my wife noticed and they changed the dish with a serving of kadhai paneer. So wasn’t really able to review the dish. Veg Tawa Masaala – 2.5/5, this qualified just as being edible and wouldnt be something that I would order individually apart from making the numbers in their Veg thali. Veg Biryani – 4/5, this is pretty good and tasty for a veg Biryani and is the second best dish we tasted after dahi kebabs. 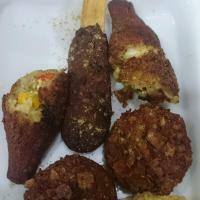 Stick Seekh kebabs – 4/5, a fairly good and a unique preparation. Kurkure mushrooms – 3/5, had a stuffing of mushrooms and was quite alright. Dahi kebab – 4.5/5, this is one dish that stood out in the entire food fare and we liked it very much. 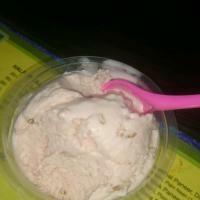 I have tasted better dahi kebabs in Pune only in Oye Pape and this one is a close second. Talking about ice creams, the Giani ice creama have a bit of a different flavor to them and so far tasted Rose(4.5/5) and Vanilla (3.5) flavors and would definitely like to taste other flavors. In terms of service there’s quite a bit to improve before customer can truly say “Wah Ji Wah” as the service is slow and servers almost always even forget to refill water on their own unless you remind them all the time which could be quite annoying.